Brandon Beilis, Nick Bombicino, and Jackson Thompson in Delirium's Daughters. Photo by Michael Blase. BOTTOM LINE: Four suitors desperately try to win the hand of a stubborn patriarch’s three daughters. 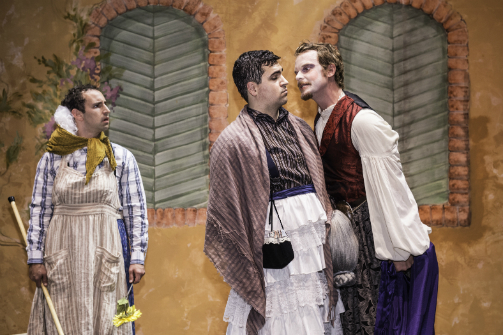 Commedia dell’arte cleverly meets modern sensibilities in this comedy that delightfully exemplifies its own title—delirium. Nicholas Korn has taken the spectrum of madness in our daily lives and condensed it into a 70 minute romp. Delirium’s Daughters takes place in the villa of Signore Di Lirio (Branislav Tomich), a lively though senile man who lives very happily with his three daughters: the classy Terresa (Deanna Gibson), the headstrong Marina (Stephanie Nicole Kelley), and the savvy Celia (Kerry Frances). However, in one morning Di Lirio’s content life begins unraveling when four imperfect suitors ask to marry his three daughters. Serio (Evan Zimmerman), though honest in his love for Terresa is completely lacking in humor; Timidio (Brandon Beilis) is kind natured but lacks the backbone required to stand up for himself, never mind for Marina; and Celia must choose between Pomposa (Jackson Thompson), a gentleman both wealthy in money and ego, and Giovio (Nick Bombicino) whose reputation for wit and tomfoolery precedes him. Confronted with an overwhelming decision, Di Lirio concludes this is a decision best left to his wife, for “my wife, as a woman, is best suited to know what’s best for our girls.” Yet, herein lies the “gentle madness”—Di Lirio’s wife has been dead for three years, yet he still talks to her and believes she replies. When he returns and announces his wife decided their daughters are too young to marry, the mad comedy begins as Giovio concocts a series of tricks ranging from the suitors dressing up as their mothers to faking his own death—all in an effort to change the mind of a delirious old man frightened of being alone. The strong collaborative effort put into this production is beyond apparent. Half of the comedy is watching how well these actors play off each other. The scene when all the suitors return to the villa dressed as their mothers (one of Giovio’s schemes to earn Di Lirio’s good wishes) is pure comedic delight. Each suitor reacts perfectly to each other’s varying embarrassment (Zimmerman’s portrayal of Serio’s extreme discomfort steals the show), Terresa and Marina share in this cocktail of frustration and disgust, Celia seems to enjoy the spectacle, all while Di Lirio is equal parts oblivious to and entranced by the madness before him. All of this, of course, is made possible by Kathleen Butler’s spot on direction. Mix it all with Izzy Fields’ intuitive costume design and it’s nearly impossible to contain your laughter. Delirium’s Daughters is perfect for anyone looking for a fun evening. If you’re willing to look past the price tag, this show is worth seeing for a good laugh, or to satisfy your appetite for well orchestrated Commedia.